Home Solid-State Drives SSD Upgrade Solution Transcend SSD+ Upgrade Kit Transcend Introduces Its SSD+ Upgrade Kit: The Easiest SSD Upgrade Solution Ever! 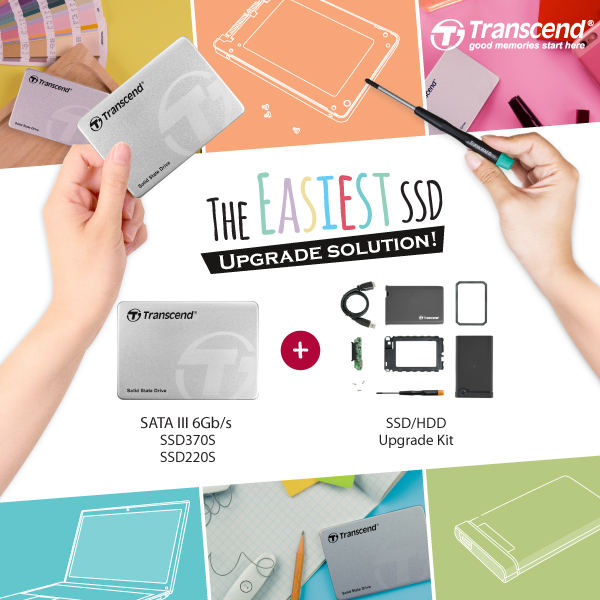 Transcend Introduces Its SSD+ Upgrade Kit: The Easiest SSD Upgrade Solution Ever! Transcend Information, Inc. (Transcend ), a worldwide leader in storage and multimedia products is proud introduce its latest SSD+ Upgrade Kit, a quick and easy SSD upgrade solution for users to enjoy a hassle-free SSD upgrade experience. Faster read and write speed to enable faster application launch and system boot up time, runs cooler, runs longer on battery as well as resist data lost from bumps are the known significant advantages of solid state drives over the traditional hard drives. Yet, not every SSD available on the market is bundled with a proper upgrade kit to make SSD upgrade a pleasant experience. The Transcend SSD+ Upgrade kit is bundled with all the necessary hardware and software to make SSD upgrade hassle-free and enjoyable experience for all. Transcend SSDs are built on the next-generation SATA III 6.0Gb/s interface and is capable blazing-fast transfer speeds of up to 560MB/s, about 5 times faster than a traditional mechanical hard drive, delivering faster system boot up time, faster application launch for all your daily needs. Transcend offers a wide range of SSDs for various needs, ranging from the entry-level SSD220 to the high-end SSD370 that comes in capacity of up to a total of 960GB for your high performance storage needs. The existing HDD or SSD doesn't go to waste after the upgrade, as it can be converted into a portable USB 3.0 storage device with the bundled StoreJet 25CK3 enclosure that comes with an outer rubber case and an inner rubber shock absorber for optimum protection against shock and vibration. The upgrade kit also features a one-touch backup function that utilizes the Transcend Elite software to synchronize important data to the drive with a single touch on the backup button on the enclosure. Data migration from current HDD or SSD to a new SSD can be easily done with Transcend's advanced SSD software tool in just a few clicks. It also features other advanced features such as monitoring SSDs health status with S.M.A.R.T. technology, enabling TRIM command for the optimum transfer speeds, and keep your SSD's firmware up-to-date.